How many times have you witnessed a dollop of toothpaste on the brush, that never made it out of your child’s mouth? Countless isn’t it?!! It is as it is a struggle to drag them out of bed, even tougher to convince them to manage to scrub their teeth, and then comes the struggle of making them spit out the toothpaste. 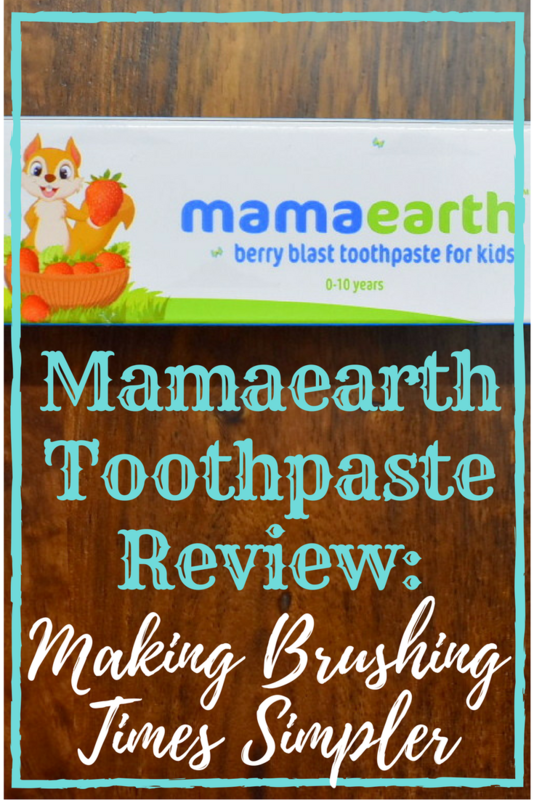 I recently came across Mamaearth toothpaste for kids. Mamaearth is truly a brand that does not need an introduction and with this latest addition to their range, they are sure to win us all over. So let’s check out my experience with the Mamaearth toothpaste and see if it appeals to my Twinadoes. The Color and Consistency of Mamaearth Toothpaste is a slightly tinted clear gel, Almost transparent. The Toothpaste is suitable for children 0 to 10 years. It is ok if the kids swallow some toothpaste, which is a BIG PLUS. In fact, Mamaearth is the only brand that says that it is OK to swallow a small amount of toothpaste. The struggle with little kids is real, it is impossible to make them spit out the entire quantity that they put on their toothbrush. It is 100% Natural, free of all kinds of Toxins – do I need to elaborate more? The toothpaste is very easily available on leading shopping and parenting sites like Mamaearth, Babychakra, Amazon, Firstcry, Nyka and so on. Overall I love the toothpaste and how fuss-free brushing times have become. However, it would be great if a fluoride variant (or whichever ingredient can resolve to better tooth cleaning) should also be available, as older kids need stronger cleaning. My kids are also using this toothpaste and happy that they liked it’s taste , I also tried and liked it . Good that Mama Earth is coming up with such products for kids. There are so many varieties of toothpastes available that it is nothing short of a mind game to pick one. Your review is helpful. can we use it for kids elder than 3 year too? I like the toothpaste in all its senses. But in my experience with kinds of toothpaste, after 2.5-3 years of age, mainly when kids learn to spit all the toothpaste out, we must switch to fluoride-based toothpaste. That’s not scientifically supported, but my own view and experience with various products I have tried. The Mamamearth toothpaste is suitable for children upto 10 years, as per package instructions. my daughter hates her brushing time and runs at the sight of her brush. i hope she likes this berry flavor ! Recently came to know Mama Earth has a children’s Toothpaste also. It is good to see a brand bringing out safe products for children. My alltime favorite brand. Safe for the children. Nice review. My son used to swallow toothpaste and that is why it’s recommended to use age specific toothpastes for children. I love this article and I would love to try Mamas Earth products for my son. My daughter loves to use this toothpaste. She actually swallows it. I love how safe Mama Earth products are made. Mamaearth has some nice products which are free from unhealthy ingredients. I am so sure my son will love this toothpaste as well. Amazing and informative post. Mamaearth toothpaste is best for kids. The flavor of the toothpaste attracts kids. Great thought.